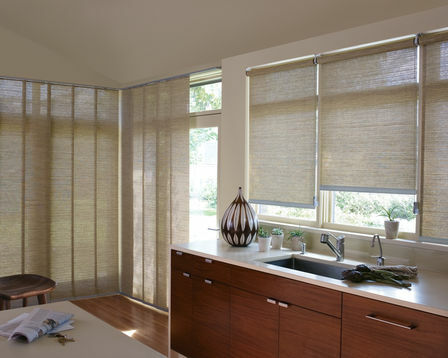 Screen shades provide sophisticated style, ultraviolet protection, and privacy with a view. Available in a vast selection of beautiful fabrics in a variety of colors, textures, designs, and opacities, they are perfect for any room in the home including screened porches and sunrooms. Hunter Douglas custom Designer Screen Shades offer performance screen fabrics that focus on exceptional characteristics that provide enhanced glare and heat control with superior UV protection. In addition, superior operating systems offer simple functionality at a great price. Enjoy the convenience of our battery operated or hard-wired control systems doing the work of raising, lowering, traversing or tilting your screen shades for you. Providing the ultimate in window treatment control, our motorized systems allow you to operate your shades individually or in groups, by remote or programming. Simple and cord free, our motorization options are aesthetically pleasing and safer for children and pets. Skyline® Gliding Window Panels are a patented twist on vertical blinds. A sleek, up-to-date design lends drama to any décor, whether covering large windows or when used as a unique room divider. Like screen shades, Skyline Panels provide sophisticated style, ultraviolet protection, proprietary operating systems and privacy with a view. The perfect solution for any room in the home including covered patios and sun porches.